"Watch - and see what life teaches." 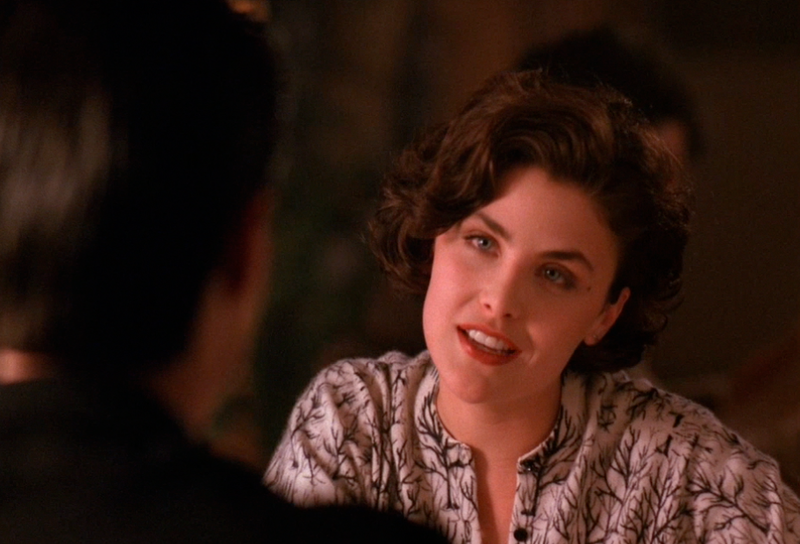 The first episode of the series proper, later entitled Traces to Nowhere, was co-written by Lynch and Frost, and directed by Lynch's Blue Velvet editor, Duwayne Dunham, who also edited the Pilot episode, offered an opportunity to join the Twin Peaks stable of directors in an effort to retain his editing services for Lynch's Wild At Heart. 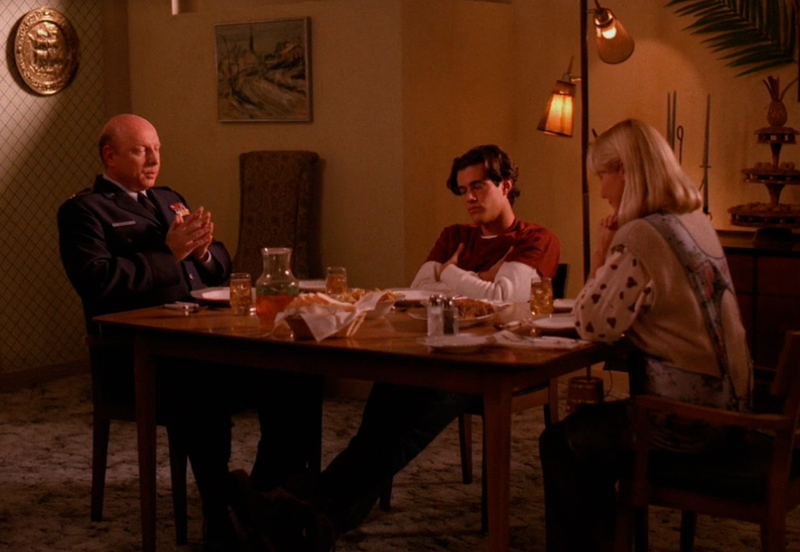 This feels to me like one of the episodes that holds most closely to the central themes & conceptions of the Lynch-directed episodes, and I think it's my favorite of that category. The tone has changed from the Pilot, being somewhat warmer and less strange than the grey & blue, chilly, grief-drenched Pilot episode. 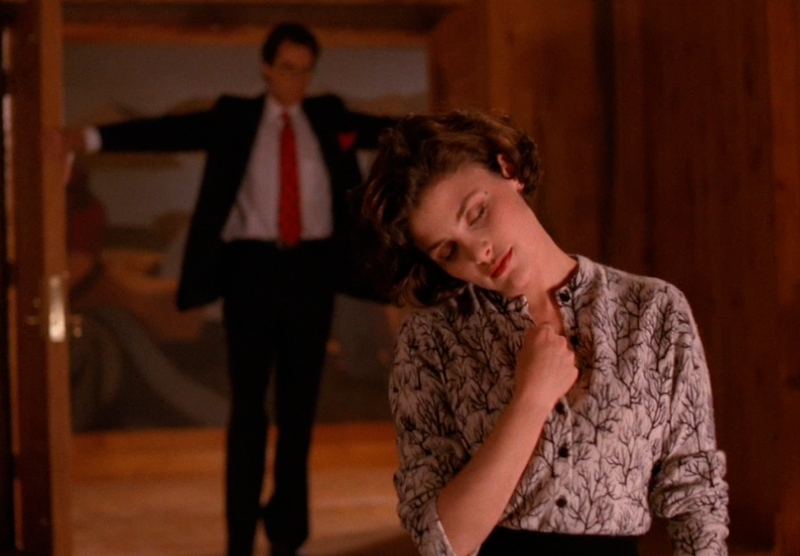 It feels one-of-a-piece with the next episode, Zen, Or The Art To Catch a Killer, where Lynch again directed, picking up this lighter tone and moving it in his own directions. The Log Lady introduction for this episode emphasizes the role of the detective, of being observant to the details of life and to the behaviors of people, following the chains of causation that gave them rise. 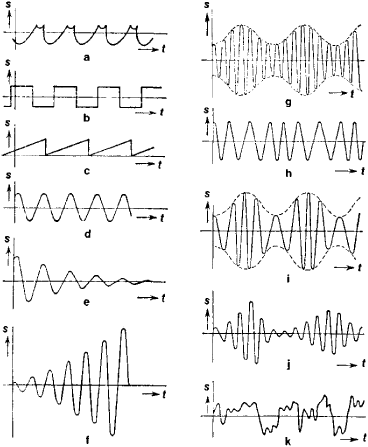 These concrete & manifest occurances, the clues or "traces", lead back into the nebulous mysteries at their origin, the "nowhere" grasped at in Cooper's dream visions of the Red Room yet to come. 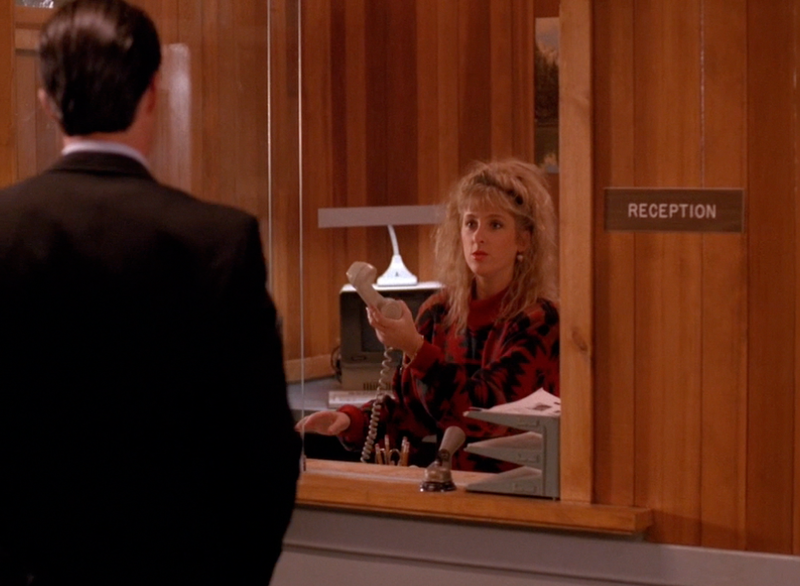 The episode opens with an establishing shot of the Great Northern Hotel, and cuts to Cooper's nightstand. It appears to be around 6:18 am. 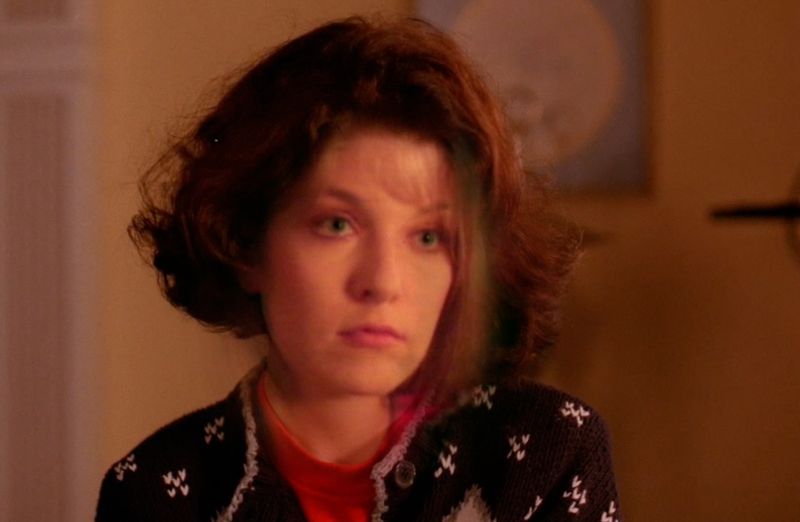 The camera pans past examples of many of the animal ornaments that populate Twin Peaks: the deer hoof gun rack, a duck and some wild fowl, and a mounted fish. That gun rack (the Martel's have a similar one) always seemed bizarre to me: the dismembered deer seems to offer up the weapon with which it was hunted, a mildly disturbing emblem of the close and interconnected dynamic between the victim & the aggressor. 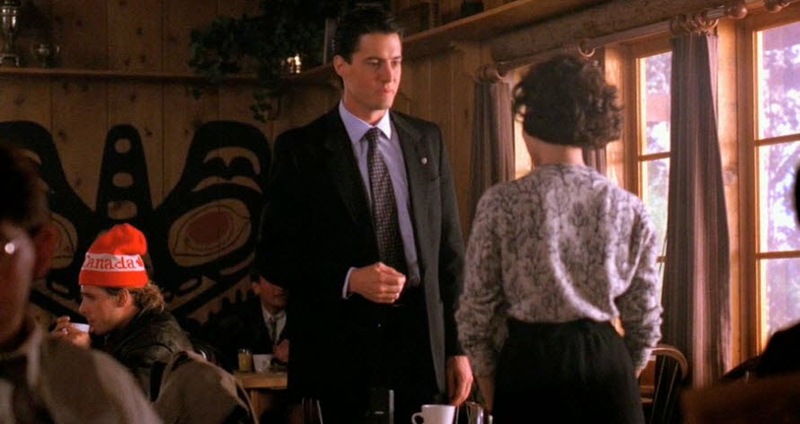 Overlaying the sequence is the Badalamenti jazz track, "Freshly Squeezed", which I think implicitly places Cooper and Twin Peaks within the film-noir genre, but at the same time sounds a little absurd or ironic. The image of Cooper hanging inverted sort of announces that this will be an unusual take on the detective genre; the title Traces To Nowhere suggests that the whodunnit will lead back into existential/metaphysical dimensions. Cooper is engaged in some sort of yogic discipline (he original script calls for a "one handed yoga "frog" position"), hanging from a sprinkler pipe running across the entrance to his hotel room. I've seen this neighborhood change from pastures to the hellhole it is now. I've put every damn pipe in this neighborhood! People think pipes grow in their homes - well, they sure as hell don't! 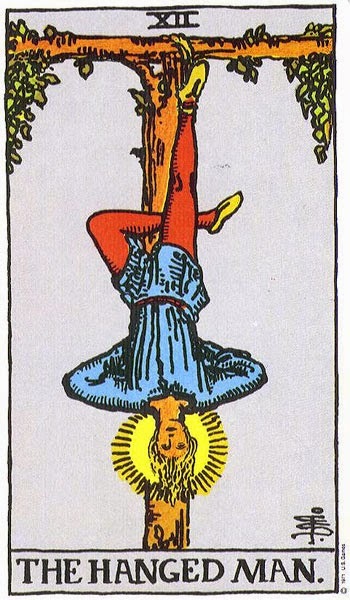 Over time, The Hanged Man came to depict a man hanging in a state of balanced, calm repose, and for many people the image came to represent a meditative mindset, a sense of trust in, and reliance on, the cosmos itself, and also a revolutionary perspective, of seeing things "upside-down", a state of radical insight. 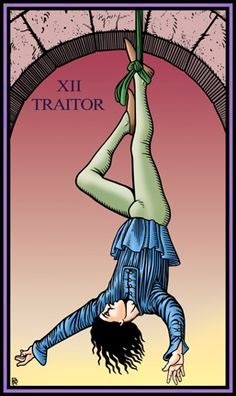 My own theory is that this image of a state of humiliation and exile from society depicted in The Traitor, morphed over time to represent a sense of freedom that comes from being apart from society, permitting one to view things outside customary and culturally-determined perspectives. The state of loss transforms into a state of acceptance, of trust and reliance upon the greater scheme of things. 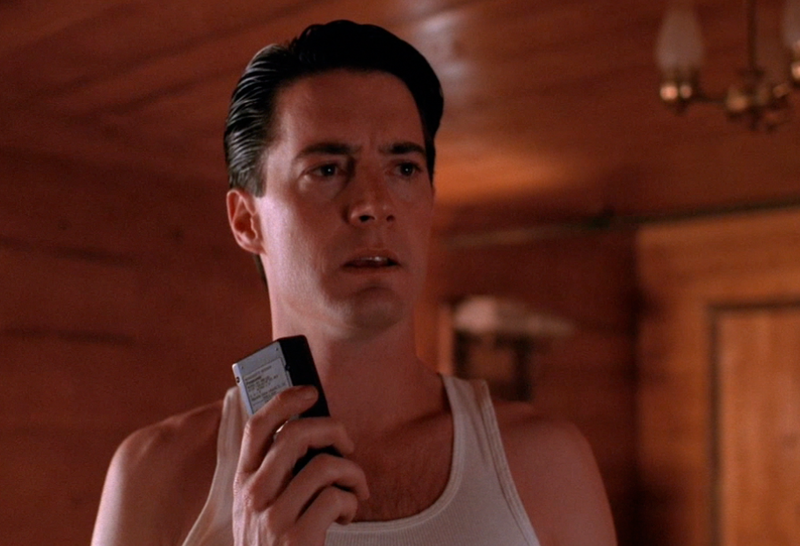 I see Cooper as sort of an outsider, whose unusual habits and perspectives allow him to penetrate into the mysteries surrounding Twin Peaks, its woods, and into the Blue Rose cases. 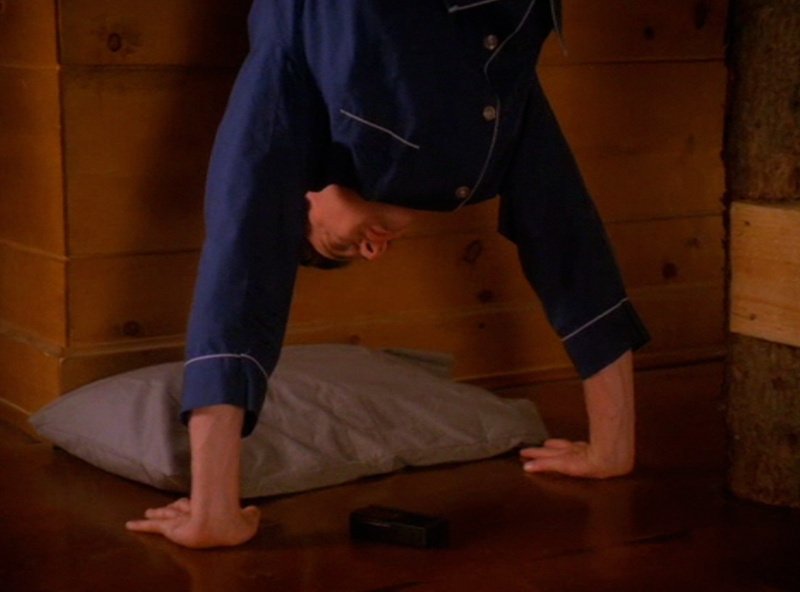 Establishing a sense of rhythm and symmetry, he assumes an inverted position twice in the series, here and again near the beginning of the second season, in The Orchid's Curse, where it allows him to catch a detail that he had heretofore missed. 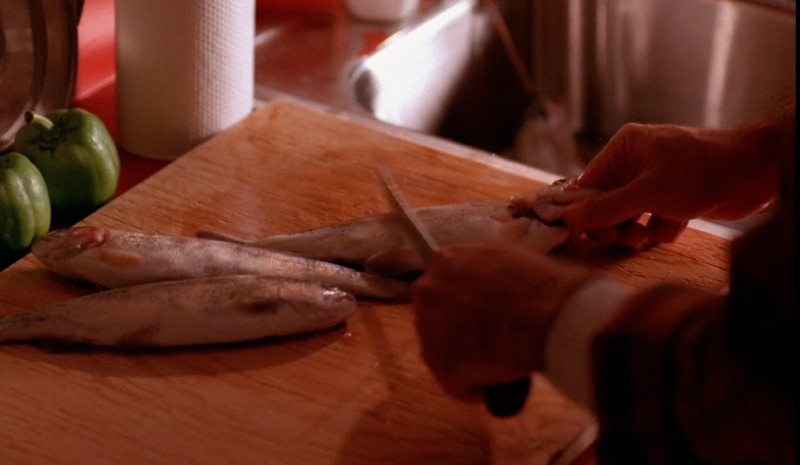 The scene ends with speculation on the Keneddys: more presidential references, and a nod to the Marylin Monroe proto-origins of the Laura Palmer story. 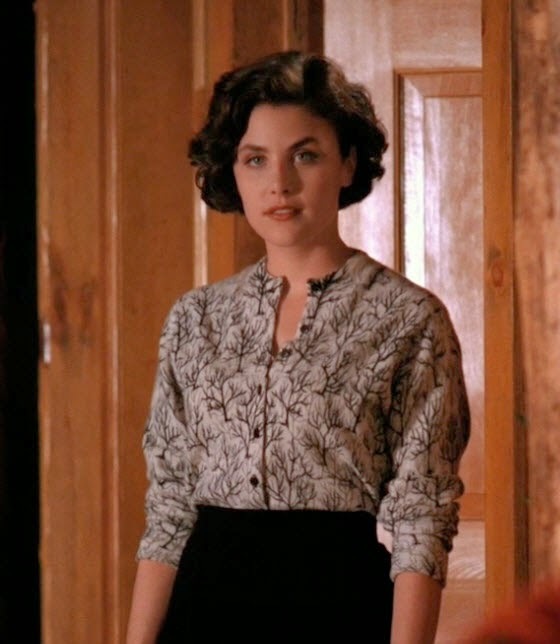 After Cooper samples The Great Northern's coffee, Audrey enters the dining room dressed in a really beautiful black-and-white blouse, decorated with leafless trees. The Horne family is deeply interwoven, somehow, with the fate of the Ghostwood Forest. That Canada toque in the background - I used to have one of those! It marks the first reference in the series to Canada,I believe, the evil Northern land of drugs, slimy Quebecois bartenders, Lil' Nicky's criminal father, and the Pink Room nightclub from FWWM. 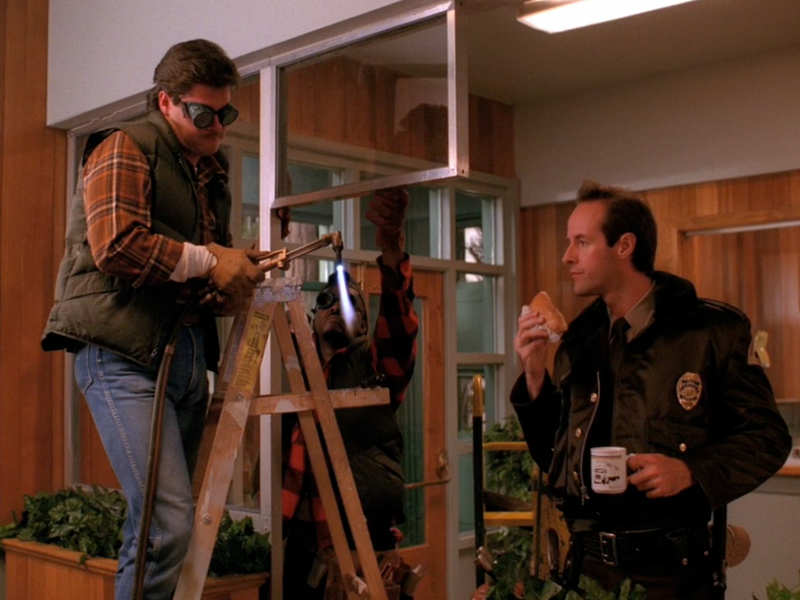 When Cooper enters the Police Station, there are two welders near the front door who seem to be installing some glass paneling around the waiting room. An odd detail. 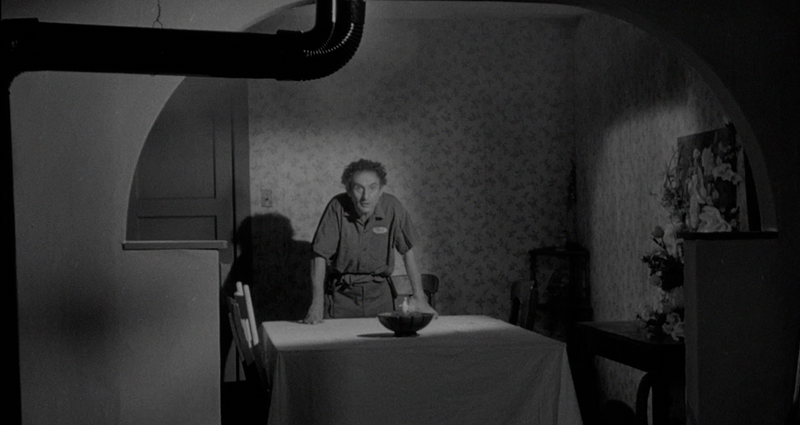 It reminds me of the man in the entrance to Hap's diner in FWWM, who is working on a lamp with a soldering iron. These bring to mind the FWWM scenes of the meeting above the convenience store, with The Electrician. The work of all these various tradesmen seems to have metaphysical ramifications. 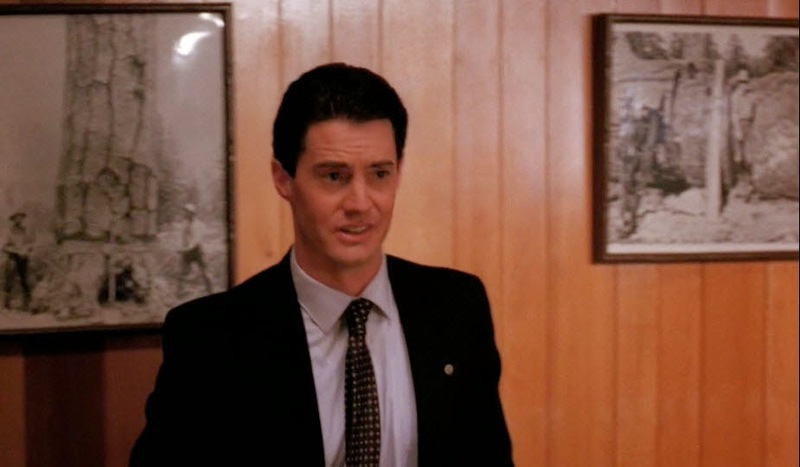 After Cooper passes by the welders, and Lucy with a mouthful of doughnuts, he heads into the conference room to talk with Sheriff Truman, where we see some black-and-white photographs hanging on the wood-paneled walls. These photographs show up in the background in various places & sizes throughout the series. Looking like they are from the early decades of the 20th C., and to me they serve to highlight a generational theme running through Twin Peaks, of how cycles of behavior and influence move through families and community. The photos are also, of course, logging pictures, giving rise to thoughts about how Twin Peaks exists in relation to the woods that surround it, relying on them for commerce and industry, and at the same time being maybe a destructive & parasitic force within the surrounding ecosystem. The photo on the left seems like a standard logging photo, but the photo on the right seems a little more unusual, of a man wedged in between the cross-sections of a felled tree. 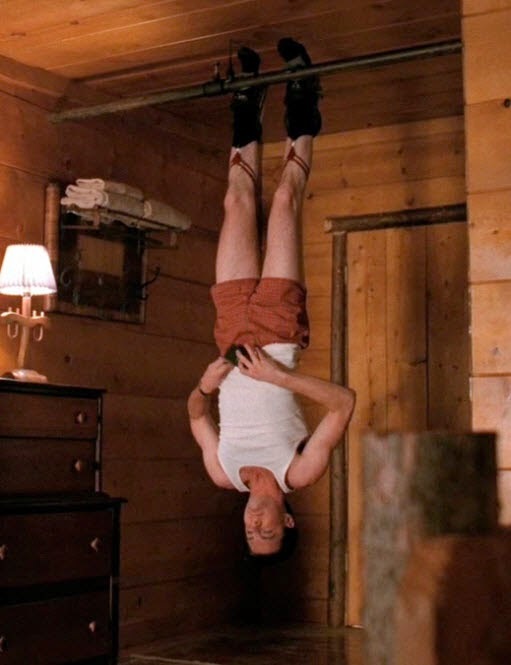 To me, it connects with several characters in Twin Peaks, like Harold Smith or The Log Lady, who seem to take refuge in the element of wood, against some outlying evil. I also wonder if these photos aren't a nod to Lynch's own childhood memories, spending time in the woods with his father, a research scientist for the Department of Forestry. 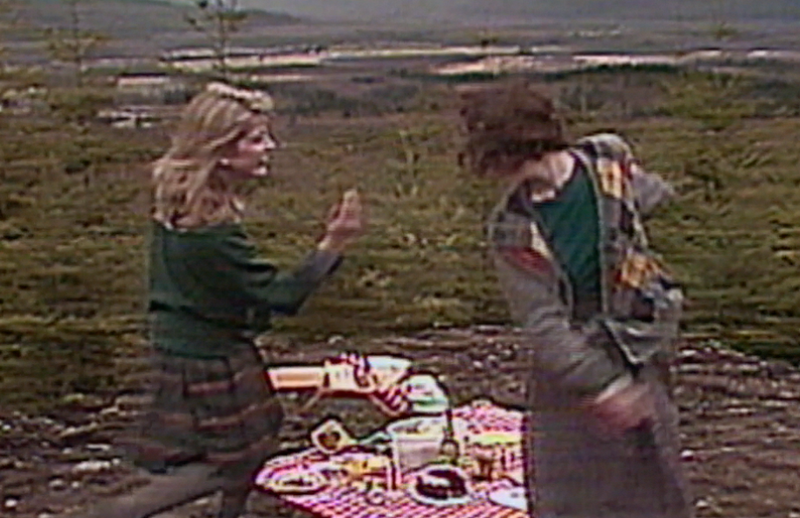 Halfway through the episode, there is a strange interlude, with the picnic video footage being played in slow motion with a ringing, crystalline version of "Laura's Theme" playing over-top. 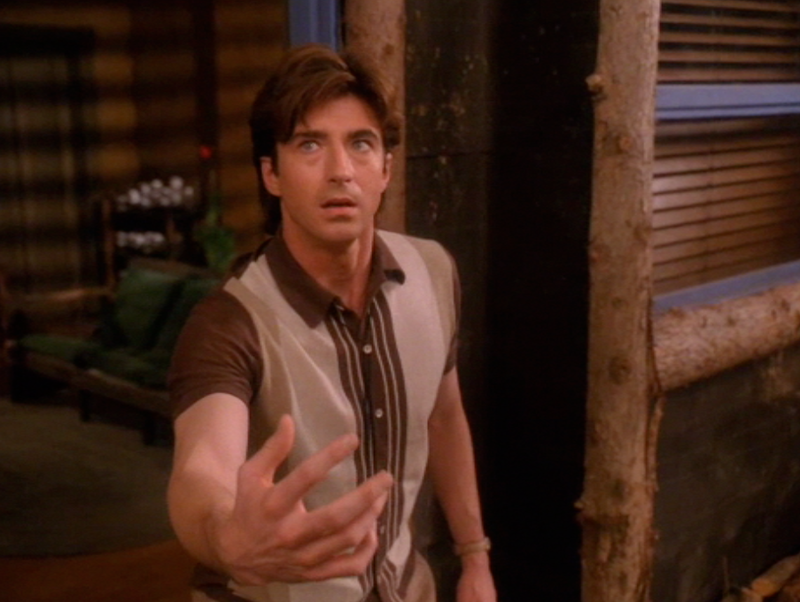 The sequence ends with a freeze on Laura's face, and an unfamiliar, otherworldly voice saying, "Help Me." The scene cuts to Donna coming down the stairs to the living room in her sleeping clothes, asking why her mother hadn't woken her for a scheduled police interview. 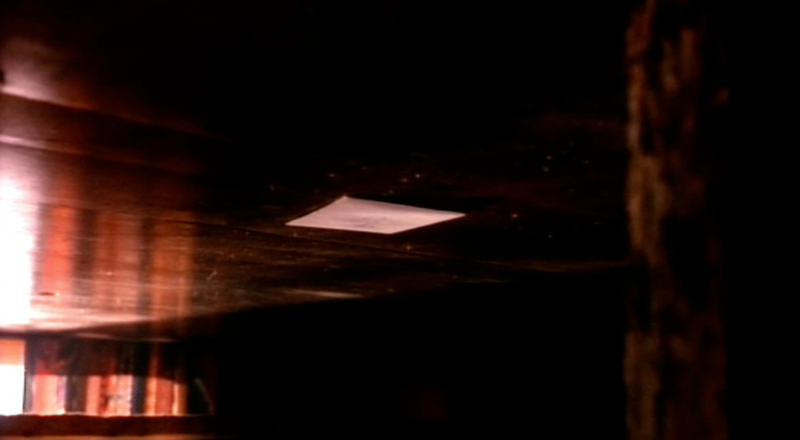 It occurs to me now that the interlude might represent Donna's dreaming - she woke her parents in the night crying, apparently sleepwalking and unaware. I've always liked this scene. The colouring seems very striking to me - those omnipresent pinkish-rose hues, the copper hair contrasted with their emerald shirts (or is it pine green? ), and the golden stain-glass window on the landing, inaugurating, I think, a emerald-gold colour motif that gets picked up much later on in the series, and may have some connections to the Hayward's house. Something very reminiscent of the morning-time about the composition, and for me the golden light of that window could represent the dream-state from which Donna's just emerged, a feeling that kind of bleeds into the conversation Donna has with her mother: "... it's like I'm having the most beautiful dream and the most terrible nightmare, all at once." Lynch always captures something strange about dreams, where sadness and bliss can exist so closely, and without reason. Mrs. Hayward takes all this in so calmly and with such understanding, it is another one of these unusual & touching parent-child scenes, along the lines of those with Major Briggs, drawing sharp contrast with the domestic horror elsewhere in the narrative. Fitting logo for a guy named Leo, badly ironic for a man with such violent tendencies. What that signifies I'm not sure, but it sounds like a good description of a frequent howling effect in the background soundscape of Twin Peaks, prominent in this episode when the Palmer house is shown from the outside. 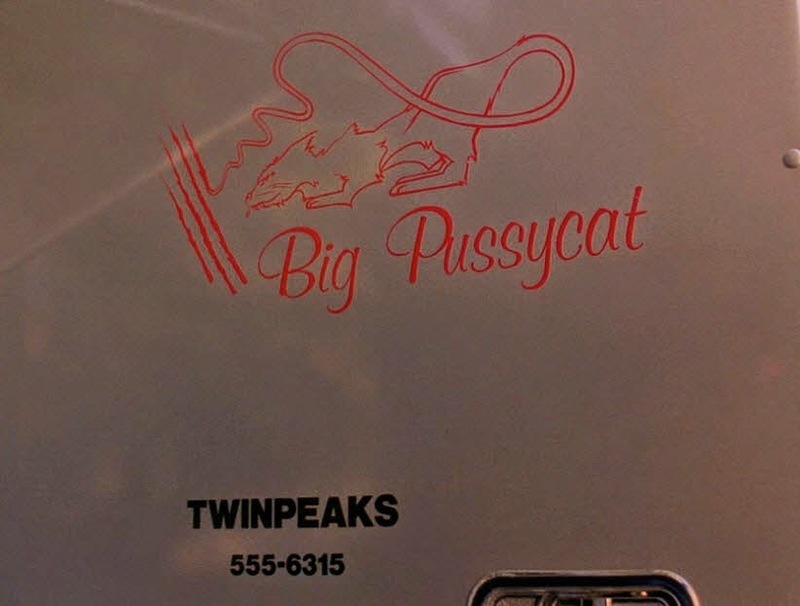 To me, the line brings attention to Lucy's role as an operator, someone who role is connect people, to ensure the transmission of messages; from the transmission of outer space messages to sonar-like beeping down trailer park electrical lines, reception of distant messages seems to be a recurrent theme of Twin Peaks. Again, Lucy's attire (to me anyway, though this could be a bit of a Rorschach effect) to mirror some of these themes & ideas. 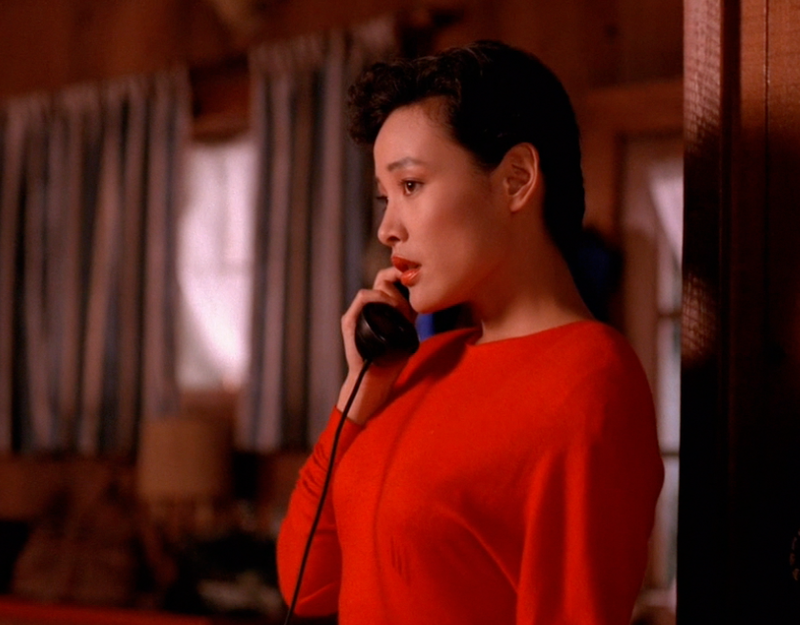 Her sweater is red and black (maybe a bit of foreshadowing for the Red Room/Black Lodge sequence at the end of the upcoming episode? 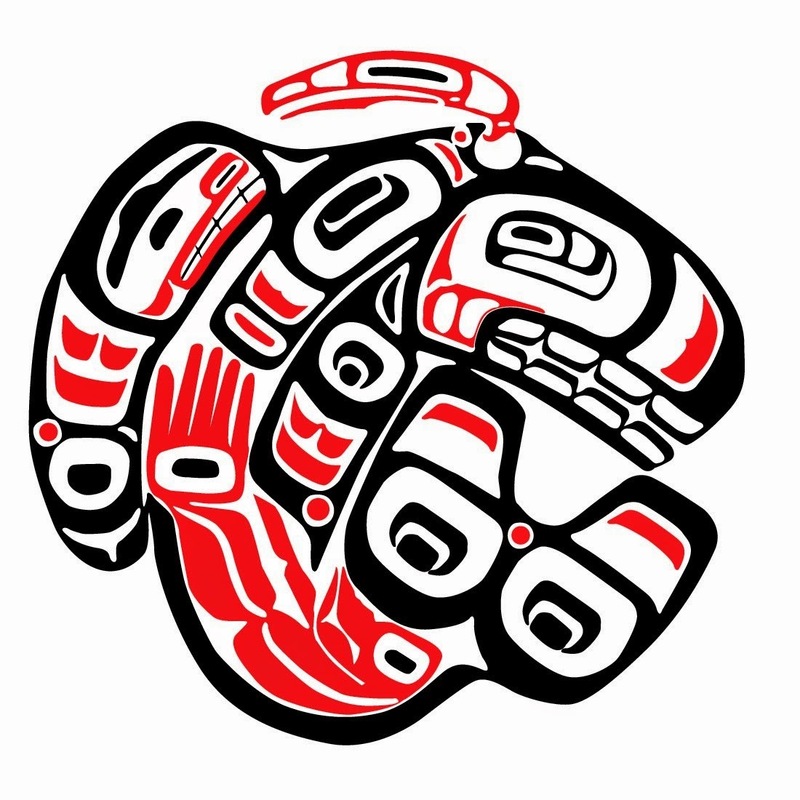 ), and it's has a geometrical pattern that looks like a Navajo woven design, another piece of the Native American background to the world of Twin Peaks. 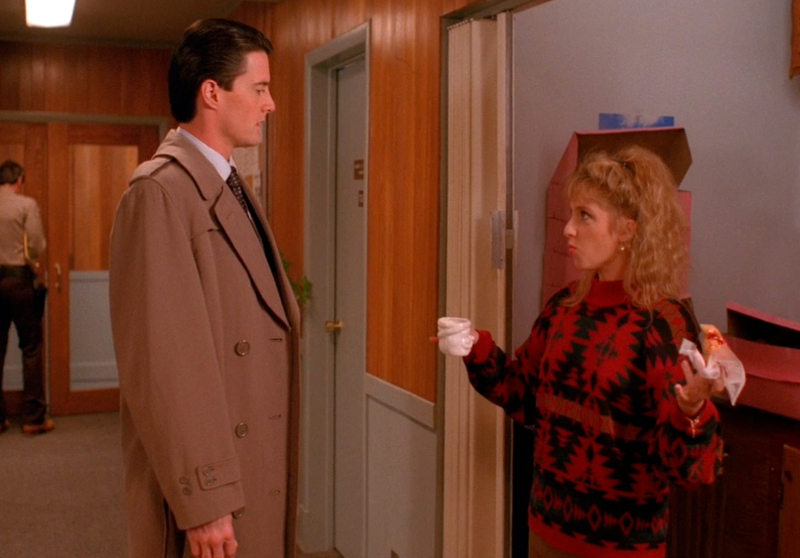 I first noticed this sweater in a later episode, when it crops up around the revelation of the COOPER/COOPER/COOPER outer space receptions, and it occurred to me then that the pattern is kind of reminiscent, maybe, of radio signal waves, or some sort of electrical frequency pattern. Try as I might though, google images would not provide me with any visualizations the sort of mandala-like emanations as in the pattern of the sweater. I'll leave it to the reader to decide if there is anything to that connection. 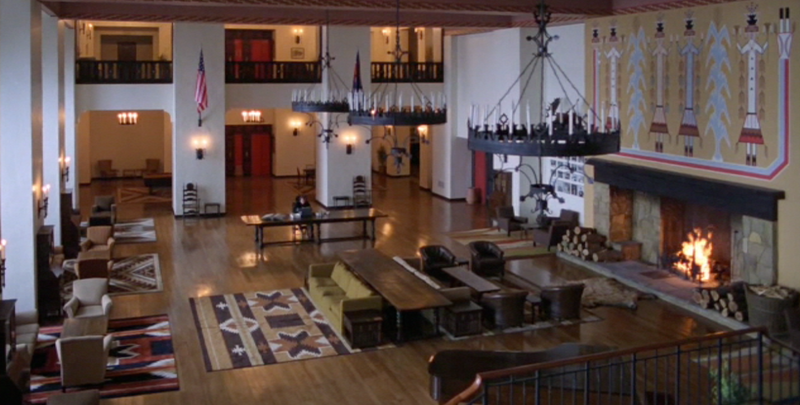 The Navajo patterning does show up again though, later in the episode. Audrey is in her father's office, standing at the centre of a pattered rug, slowly swaying, completely aborbed in some otherworldly jazz music. 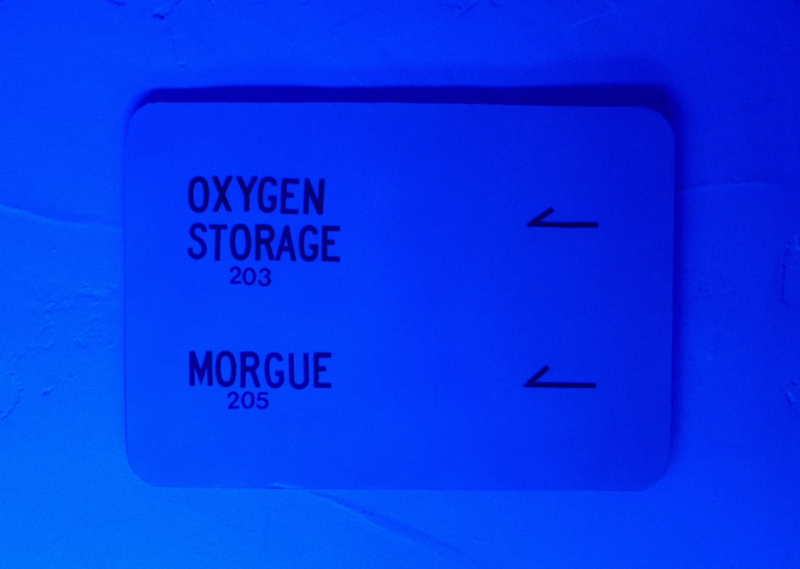 Again, there seems to be some foreshadowing of the upcoming scenes in the Lodge. 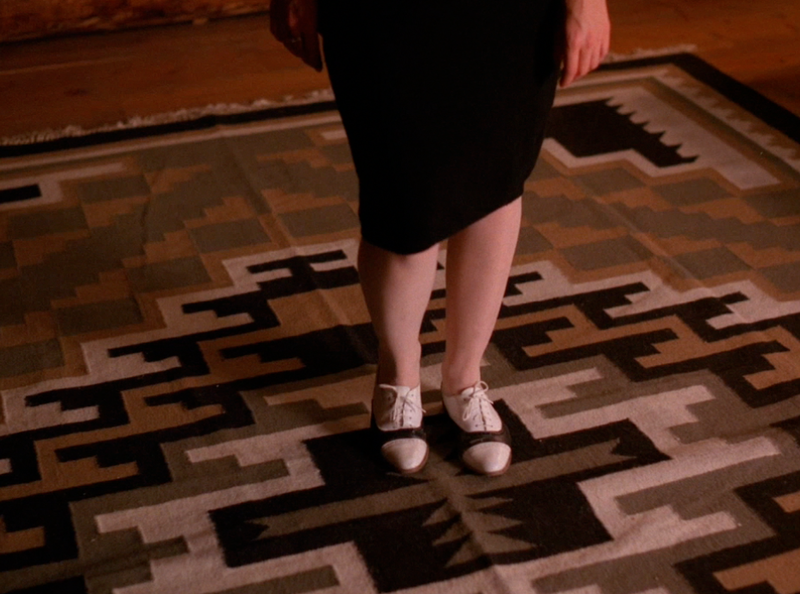 The black and white shoes, along with the geometrical patterns, are reminiscent of the Red Room floors (in a similar way to the checkered tiles of the diner floor, where Audrey dances in the next episode), and of course the dancing to jazz prefigures the initial appearance of the LMFAP. 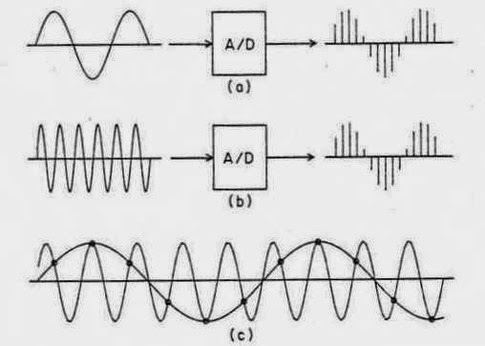 It is almost as if, when the ground patternings are of the right dimensions & proportions, and the music has the right tone, Audrey tunes into the frequencies of the Lodge. 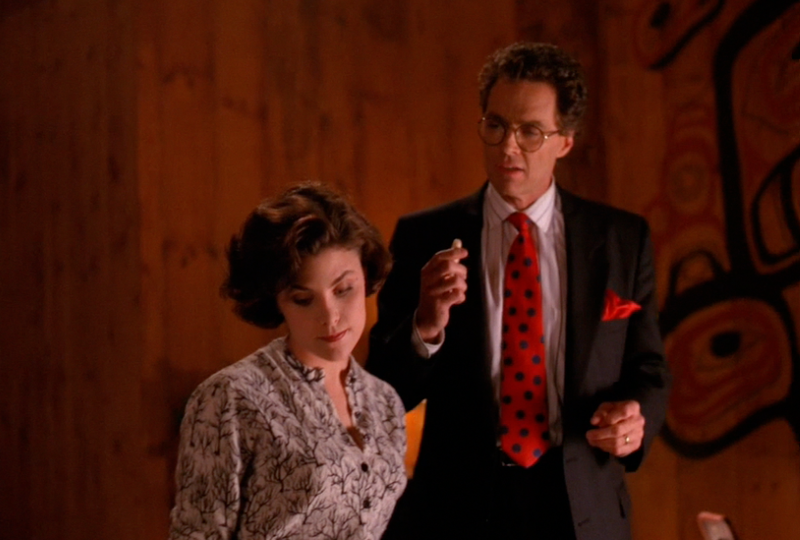 It makes me think of how perfect it might have been had Audrey, instead of Annie, had ended up in the lodge in the finale, her connection to the Lodge imagery (along with other details) would have made for excellent foreshadowing of an eventual descent into the Black Lodge. 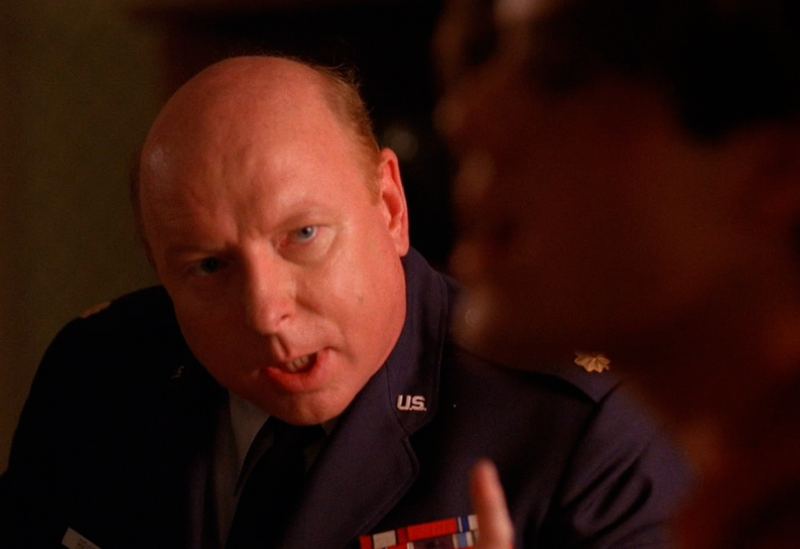 The scene that follows with Benjamin Horne is interesting as well, one of three scenes in this episode that revolve around a significant exchange between parent and teenager (Donna and her mom, Bobby and Major Briggs). Many of the thematic elements of the series are included: the woods depicted on that forest blouse, Native American art on the rug and the wall behind the desk, the sound of fire prominent in the background. A well-orchestrated scene. 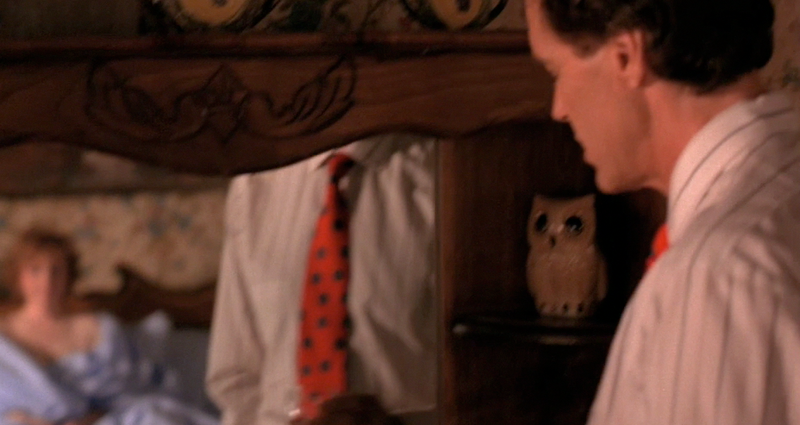 Another one of the owl ornaments peering out from the periphery in the early episodes. 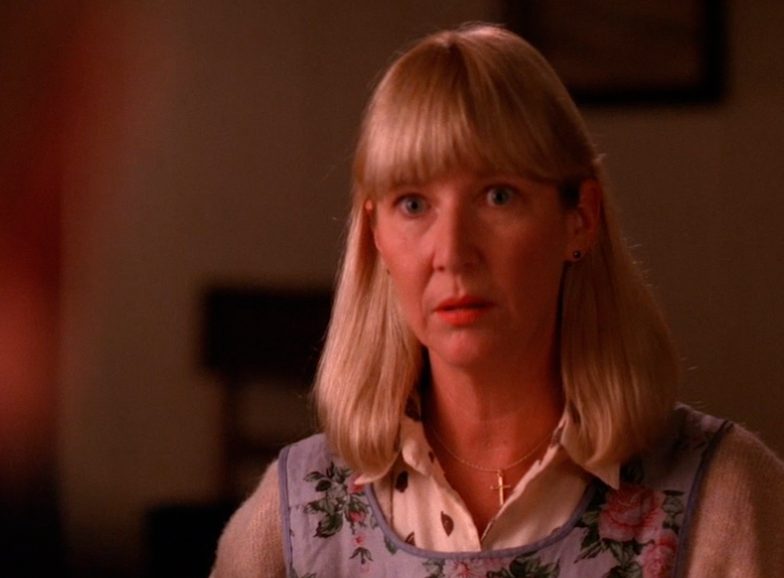 When Donna visits Mrs. Palmer, Sarah has a strange vision of Laura's face (before having a vision of BOB). 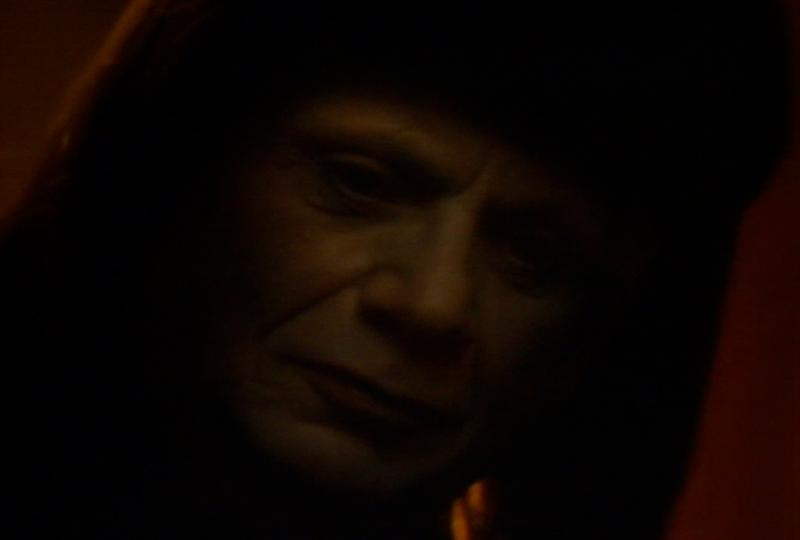 It's not that last time in Lynch's work that a somewhat lo-fi facial superimpostion will be used to unnerving effect. 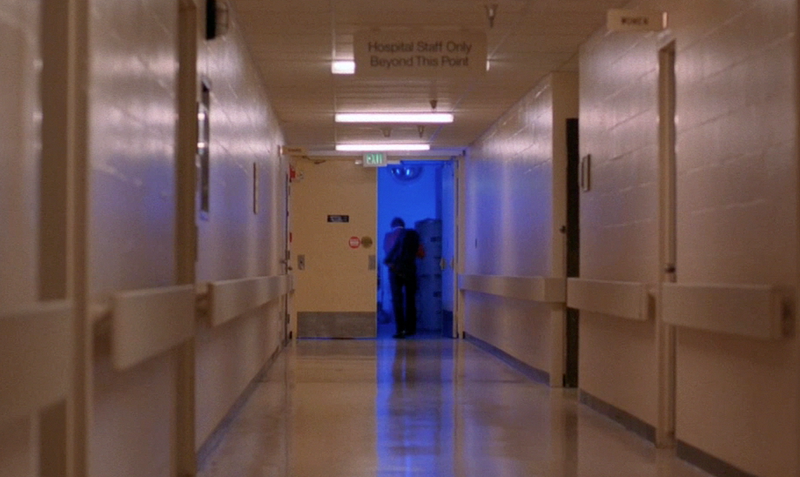 Another of the many arresting visuals from the episode: Hank enveloped in a strange blue light, after following the One-Armed Man down a hospital corridor. 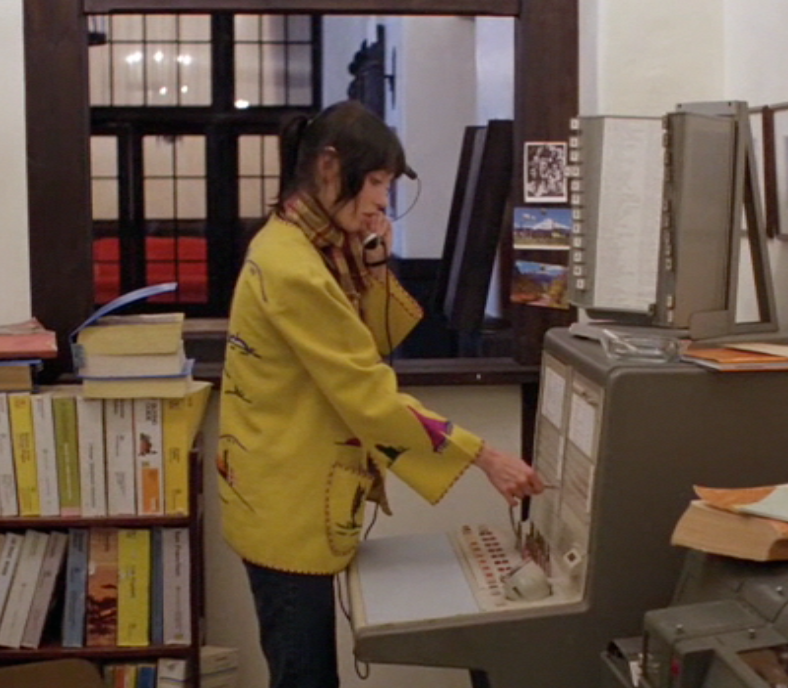 Something tells me that this isn't merely a Phillip Gerrard paying a call to Bob Lydecker. I really wonder why Mike might be going to see Laura's corpse in the morgue, a day after he'd been seen in the hospital by Cooper and Truman. Does this have something to do with the receipt of garmonbozia? 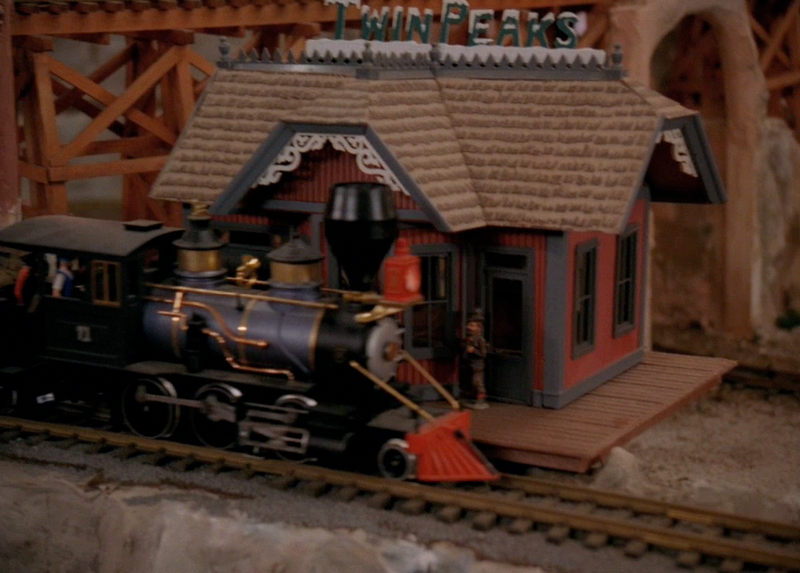 A small version of Twin Peaks in the General Store. Who is that hobo at the station? 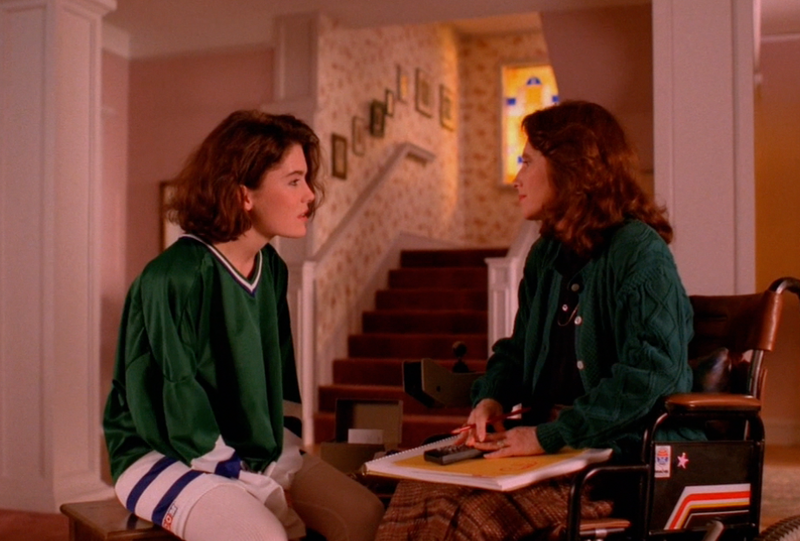 The third in the sequence of parent/teenager scenes in the episode. Audrey's jazz music creeps in again at the end of the scene of her in her father's office, and abruptly switches to strains of opera in the background of Garland saying grace. The overt religiosity, the opera music, Major Brigg's uniform and his excessively formal language all add up to an impression of the Brigg's household being oppressively rigid and traditional, a stultifying atmosphere. The cause of Bobby's attitude seems obvious, the family dynamic is likely assessed by the viewer without a second thought. 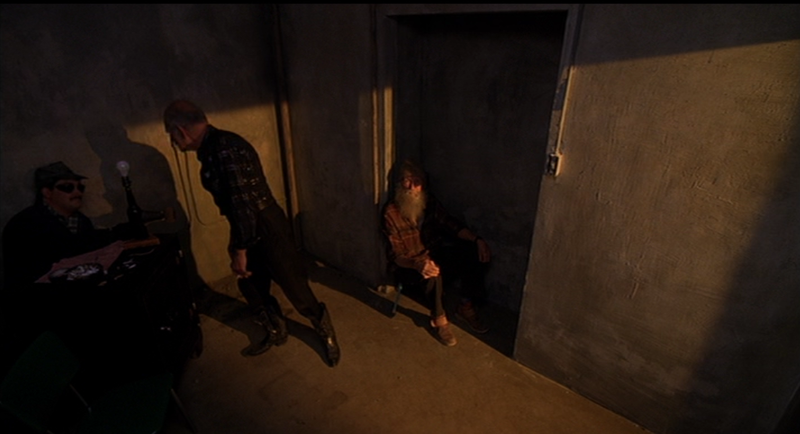 With Lynch, however, baldly absurd scenes like this usually conceal deeper waters. It doesn't become clear until Garland discusses of his visions of palazzos later in the series that he is much deeper and more intelligent than we first might have assumed, but the signs are here early on. 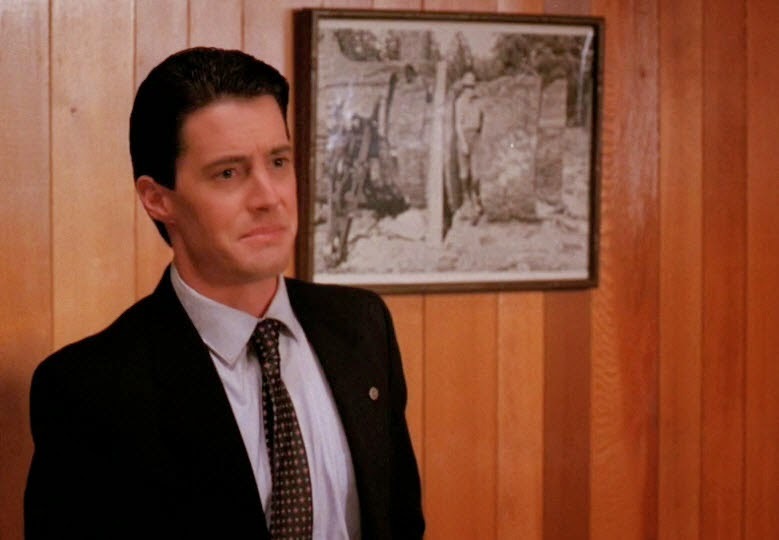 Brigg's character seems consistent with an apparent respect for a 1950's style sense of tradition and discipline: as with Gordon Cole, Agent Cooper, and maybe Lynch himself, it seems like a necessary adjunct for the exploration of greater mysteries. Major Briggs alludes to meditation: "The quieter we become, the more we hear." At the same time, Lynch, around this Wild at Heart period, allows for youthful rebellion and the freedom and individuality it offers, in part a nod to the beloved teen movies of his youth, in part a meditation on the possible moral decay of America in the later decades of the 20th century. He doesn't seem to take sides, he simply allows conflict to exist: as in Blue Velvet, the 50s and the 80s seem to occur together, side-by-side. 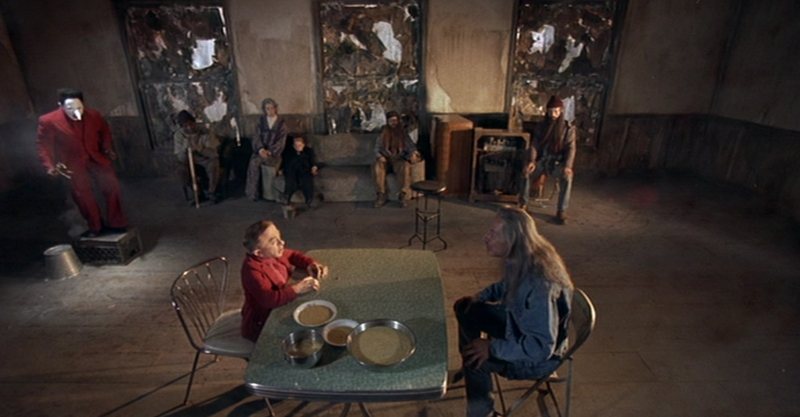 Visually, that golden plate on the wall is aligned with Garland in several scenes. To me it suggests something of his inner state, the circle connoting a sense of wholeness. Brigg's mentions the colour: "Sometimes silence is golden." In alchemical symbolism, gold, metal of the Sun, is the final stage of transmutation & purification, a series beginning with the base metal of lead. "To have his path made clear is the aspiration of every human being in our beclouded and tempestuous existence. Robert, you and I are going to work to make yours real clear!" A quote here from Joseph Conrad's The Mirror of the Sea sounds at first like a threat from father to son, to straighten up and fly right. 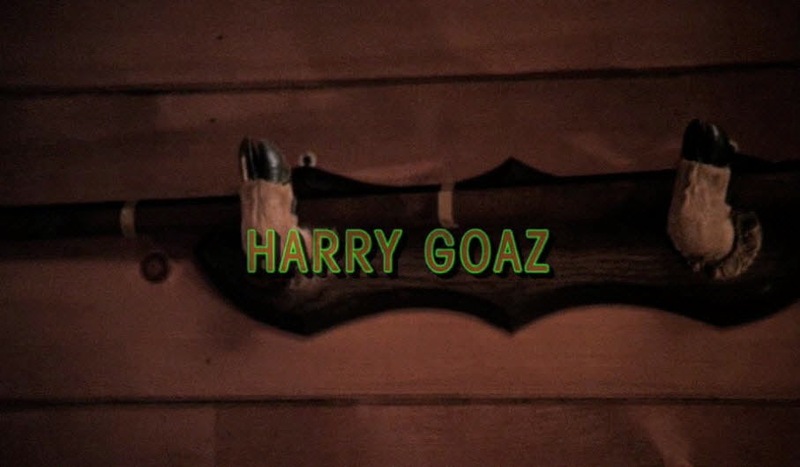 Re-watching the series, however, I wonder if maybe Garland hasn't sensed the darkness that has crept into Bobby's life, through Laura, and their dealings with drugs and the incident with Deputy Cliff in the woods. What seemed like aggression is actually resolution, to alter his son's trajectory, a process culminating in that scene in the diner at the beginning of the second season. The antagonism between Josie and Catharine deepens in this episode, and they are depicted in contrasting colours: Josie with a fiery red dress and lipstick, Catherine in a blue, first her shirt, later in sheets. 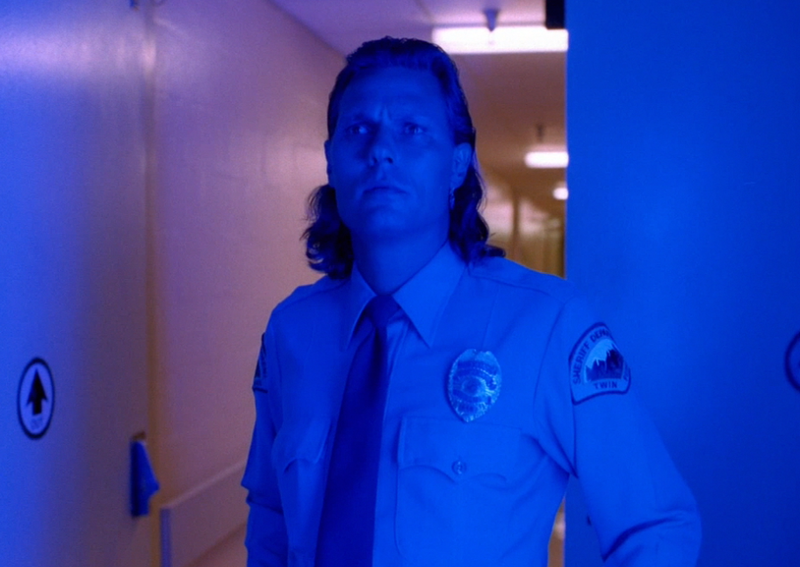 Many people have noted that blue is a colour associated with secrets in the works of Lynch, but, of this pair, we know that Catharine has no monopoly on truths to hide away. The episode ends with Dr. Jacoby reviewing one of the last tapes Laura recorded for him. 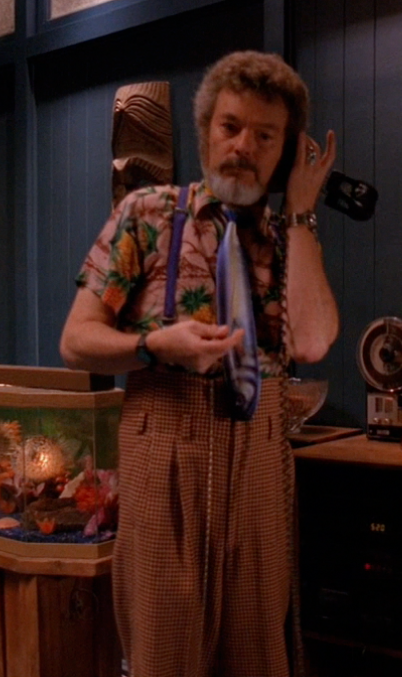 He's wearing an interesting tie - does this mark him as a philospher, one of the residents of Twin Peaks adept at catching the big fish in the silent depths of consciousness? 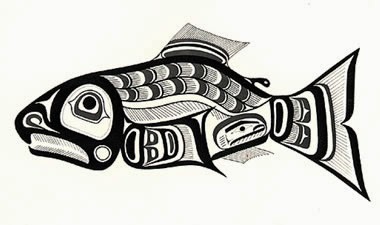 Fish have a prominent place in this episode; interesting that they come into contact with the sacred substance of coffee, and the admixture is not pleasant. I feel symbols are colliding here, and the significance is lost on me. Mysteries remain. The Shining focuses on the influence of the past, the Navajo weaving and various references calling to mind the original inhabitants of the land we now live on, and black-and-white photography recalling the presence of our immediate ancestors, building our societies upon these great resources, previously occupied. OK, guess I've figured it out. What I had said earlier is that I've been a lifelong Lynch fan since I saw the premiere of Blue Velvet. You have some great content here. It would be nice if there were a way to comment directly on each note, or even add annotations. But superb work. I look forward to more. Viageros, I like that idea of people being able to comment on each point, but I don't think blogger allows for that sort of set up. That said, I'm trying to include any corrections or additional points any readers are bringing up, so if people would like to leave them in the comments, that would be excellent. Thanks for your reply! Daniel, you offer a refreshing perspective and analyses on this brilliant TV series. 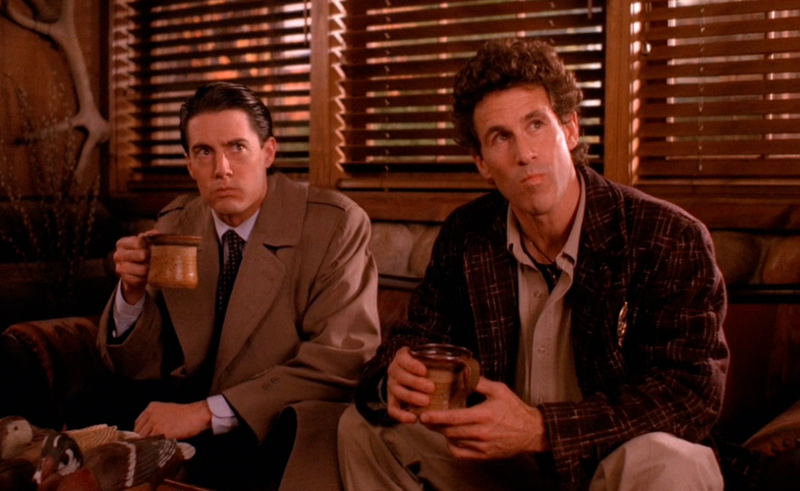 Your familiarity with the Western Mystery Traditions provides a necessary foundation for unveiling the Twin Peaks microcosm. "You're on the path. You don't need to know where it leads. Just follow." Thank you! 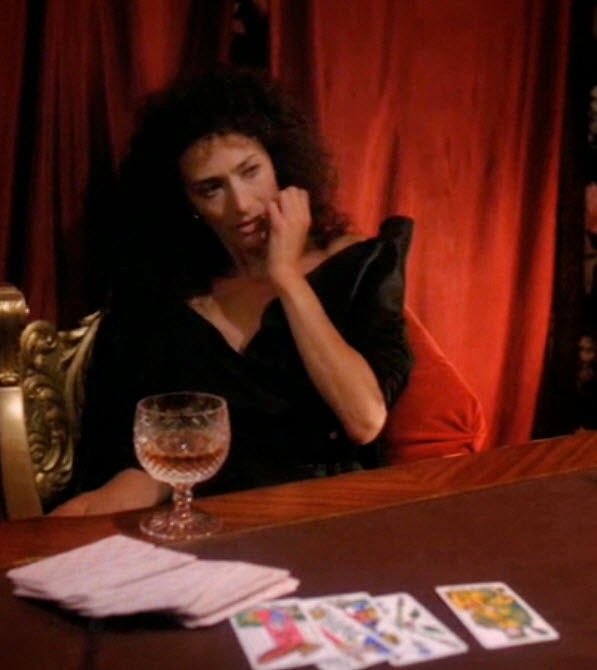 It is interesting how many possible connections to the Western Mysteries crop up in the series, considering the Lynch's spiritual interests, from what I read, are more related to Transcendental Meditation and, more generally, a sort of Hindu cosmology. I wonder if part of this might be an interest of Mark Frost in esoteric lore - or maybe just that all forms of spirituality seem to connect up in various ways eventually. Thanks anyways for your interest, I'll have you give your blog a read, looks interesting. Canada is great and I am not okay with people speaking slander of my home, especially when they probably haven't even been. If you haven't you should visit, it's really nice. The Quebequois are normal people who speak French (totally different dialect from European French, has more of a twang) and have good taste in fashion and food. There doesn't seem to be a problem with obesity there either, I hardly saw any big people there. The land is absolutely beautiful. It's a nice break from the box stores popping up everywhere, particularly in southern Ontario. I'm not saying it's perfect but you should give it a chance. 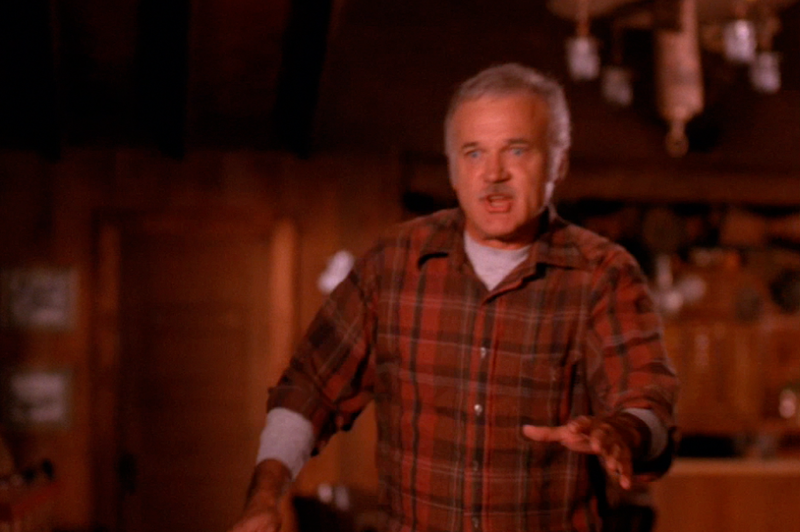 One of the reasons I love Twin Peaks is because it reminds me of when we go up north to visit my relatives. It's so peaceful. Where they filmed it was on the Border between Washington and BC, another beautiful province with mind boggling scenery. It's expensive there but that's another great place to put on your bucket list.